Join us for an exceptional yearly shopping event. Held every November and open to the public. SAC members-only the first hour! 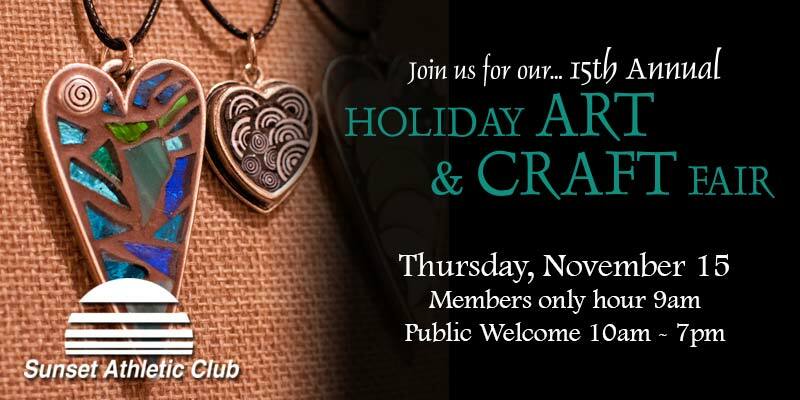 The 2018 Holiday Art & Craft Fair will be held Thursday, November 15th. SAC Members hour begins at 9:00 am. Public is welcome 10:00 am and we close at 7:00 pm. Extended hours to fit your schedule! We host over 30 hand-picked artists, artisans and purveyors of wonderful gifts. Past fairs have included: Beautiful clothing and accessories. Jewelry of every description. Yummy snacks, candies, jams & jellies; Flavored vinegars, spices and kitchen delights; Toys, clothes and fun items for the kids; Signs and unique metal art; Soaps and personal pampering items; Distilled tea beverages; Paintings and Photography; Tiles, Ceramics and Glassware -- Each year brings a new and exciting selection of wonderful and unique gifts for everyone on your list! A portion of the proceeds benefit the Oregon Food Bank. We also encourage non-parishable food donations which are accepted at the door.